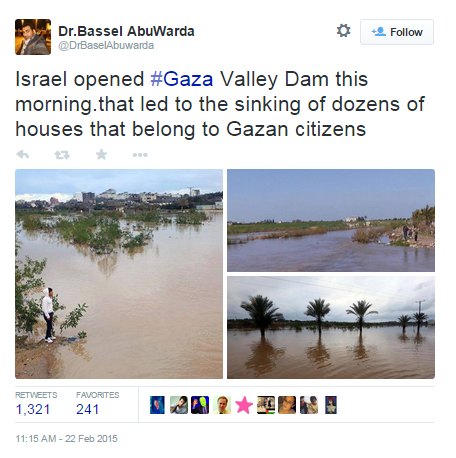 Readers who follow our colleagues at CAMERA will know that they recently exposed a fabricated story by AFP’s Yahia (or Yahya) Hassouna in which it was claimed that Israel had deliberately flooded areas of the Gaza Strip by opening dams. The same fictitious story was also promoted by Al Jazeera, the Daily Mail and Russia Today, among others. AFP did not include any Israeli voice to refute the false charge. 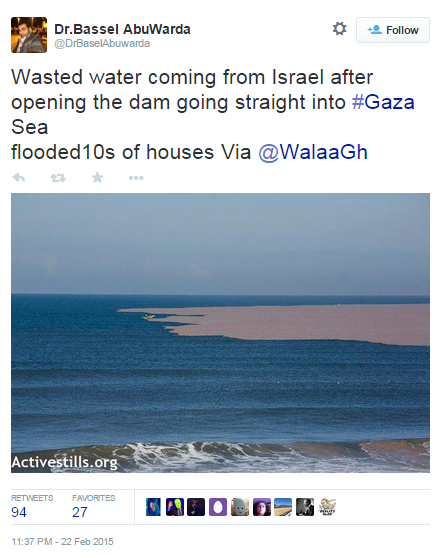 ‘The claim is entirely false, and southern Israel does not have any dams. Due to the recent rain, streams were flooded throughout the region with no connection to actions taken by the State of Israel. That same malicious ‘flood libel‘ was also promoted on social media. 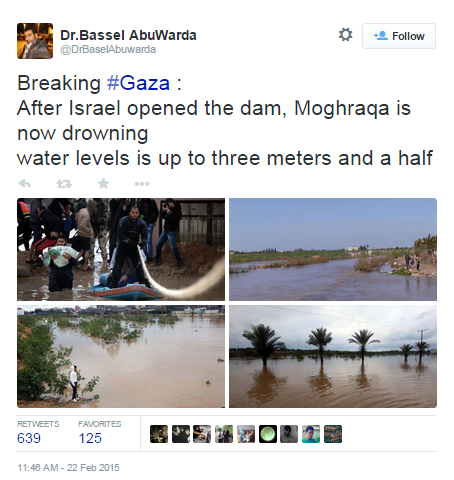 Readers may recall that Dr Bassel Abu Warda of Shifa hospital was one of numerous Gaza Strip-based doctors given BBC airtime and column space last summer – ostensibly in order to provide audiences with a supposedly authoritative and objective view of the conflict between Hamas and Israel. 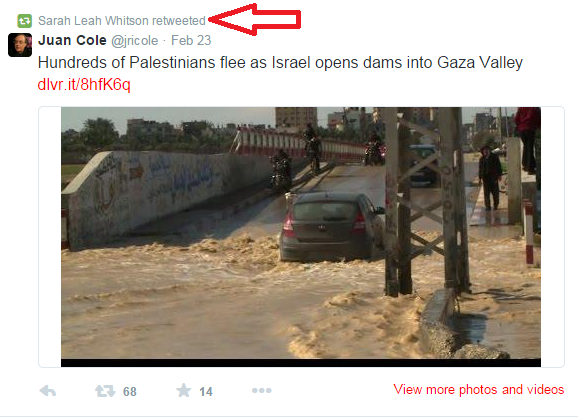 Another person who promoted the false flooding story on Twitter was Human Rights Watch’s MENA director Sarah Leah Whitson. As regular readers know, Human Rights Watch is one of the NGOs most promoted and quoted by the BBC – including on the topic of the Gaza Strip. It is always worth bearing in mind that – as cases like this one show – people from whom the BBC sources content may have an underlying political agenda. That, of course, is why the BBC has editorial guidelines which instruct its staff that “we may need to make it clear to the audience when contributors are associated with a particular viewpoint”. Unfortunately, adherence to that guideline is highly selective.